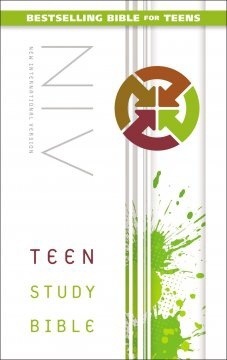 The NIV Teen Study Bible, published by Zondervan, is a uniquely designed Bible that boasts of its ability to help its reader keep in step with all God has done, all He is doing, and all that He will do within this world. This Bible contains many unique features that a geared towards a teenager’s life. These features include sections entitled as follows: We Believe, Panorama, To The Point, Dear Jordan, Key Indexes, Instant Access, Bible Promises, Book introductions, Q&A, and What Do I Read Today. Yes, many Bibles have these or similar features, but these are geared specifically towards today’s teenager. While this is a well presented publication, there are some things that, at least to me, take away from the power it could possess. The words of Jesus are not in red letter. This feature, especially for its declared audience, the teenager, is important. For a young man or young woman seeking to find Christ or beginning their journey with Christ, knowing exactly, through a red letter edition, what Jesus said would make their journey a little easier. Another questionable aspect, at least to me, is the section entitled Dear Jordan. Some of the questions asked and answered seem to be pushing the envelope, so to say. They are touching only slightly and inconclusively on topics that would be better understood or discovered though a group Bible study. All that said and declared, this is a wonderful Bible, but it should not be purchased blindly. Grab it off the shelf at your local bookstore/coffee house and check it out, thus giving yourself the opportunity to make a more deeply informed decision. The family of Jesus was going to take charge of Him. Those are interesting words, indeed. Even the family of Jesus, those with whom He spent a great deal of time, did not believe that He was the Messiah. The only thing they believed is that He was out of His mind and in need of direction. Sometimes, when others see us living powerfully for Jesus, they process the same thoughts. They have the same ideas. They see our faith. They see the way we have changed. They experience the new purpose for our lives, and they become afraid. They are afraid because of their lack of understanding of what has happened in our lives, and that makes them comparable to family of Jesus. There will always be doubters. There will always be those who reject our mannerisms, but we do not live to please them. For as Christians, we are called to live to please God. Lord, help my life stand out in a way that draws people towards You. If you have a sibling, you have experienced moments of jealousy, moments of envy. If you have a sibling, you know how it feels, even for just a moment, to be below their existence; but can you imagine being the sibling of Jesus? We read in this passage that Jesus grew in wisdom and stature, and from this we can derive that is was to the peril of His siblings. As His knowledge increased, theirs increased, but not in a comparative manner. We must never compare ourselves to others; for if we do, we will always fall short. We must never compare ourselves to others, because we all have different capabilities, different purposes. But as they are combined together for the greater good of the gospel, the work of God shall be accomplished. Lord, help me find no need to compare myself to another, for You have made me uniquely and purposefully, that I might be able to fulfill my purpose. Ephesians 6:17 Take the helmet of salvation and the sword of the Spirit, which is the word of God. Why would Paul refer to the Word of God as the sword of the Spirit? The ideology behind this statement is tied to the power that exists within the Word. When we think of a sword, we think of a powerful defensive tool, a tool that can be used when we come under attack. There are, however, restrictions. It is easy to purchase a sword. It’s even easier to reach for it in times of distress, but it will not do us any good if we do not know how to properly utilize its power. Without lessons, without practice, without the studying of techniques, a sword is just a long piece of metal. So it is with the Word of God. The Word of God is a powerful tool, as powerful as a sword. It can cut through any attempt of Satan to drag us down and pull us away from God, but simply owning a Bible does nothing. We must become schooled in its power as we embrace its teaching and trust in its guidance. For if we do not, we simply have within our possession a book. Lord, help me embrace the power that is found within Your Word. Paul, in this verse, utilizes a powerful example in regards to salvation. Paul states that the placing of the helmet of salvation upon our heads will assist in thwarting the attacks of Satan. Now this helmet is not physical, but, more or less, spiritual. It is the powerful confirmation of our salvation. It is the powerful reminder of what Jesus did for us on the cross of Calvary. It is the powerful reminder that Satan is a defeated foe. Without this helmet in place, without the grasping of this understanding, we shall be defeated easily. Lord, help me always remember that I have been saved and sanctified through Your shed blood, that I might stand powerfully in the face of adversity and come forth victorious. How can our faith be a shield? How can it be used to extinguish ALL the flaming arrows of Satan? Of course, the words Paul is using are metaphorical, for they are not referring to an actual shield or flaming arrows, but the power within both is actually comparable. The power that is found within our faith is amazing, but most people do not tap into their faith’s full potential. Our faith, our belief in God, has the power to thwart any attempt by Satan to damage our relationship with God, pull us away from the church, or away from our faith. Our faith is a shield that is impenetrable by anything, as long as we hold that belief to be true, as long as we grasp onto this as the truth. Lord, help me find and hold onto the power that is my faith. Ephesians 6:15 and with your feet fitted with the readiness that comes from the gospel of peace. The reference here by Paul is often referred to as the shoes of peace. Most people need to utilize the blessing of shoes. Most of us have gone without them at some time or another, but these moments were not usually for extensive periods of time. Without shoes, our feet begin to hurt; and when our feet hurt, it doesn’t take long for the pain to affect our mood, thus affecting the outcome of our day. When it comes to being a Christian, Paul wants us to become fitted with the peace that comes only come from our constant walk with Christ. He wants us to understand that true peace comes only as we are walking powerfully with Jesus. True peace only comes as we are the studying and application of God’s Word. Are you walking within the peace of God? Are you walking within the peace of His Word? Lord, help me embrace the presence of Your Word within my life, allowing it to fill me with a peace that surpasses all understanding. The breastplate of a soldier protected the vital organs, especially the heart. One powerful thrust of a sword to a soldier’s chest, and he was surely on his way out of this world, thus the importance of the breastplate. For the Christian, the breastplate is comparable to, in the least two things: the Word of God and the presence of God. The power to guide and protect our hearts is found within the attitude we have in regards to the Word of God and His presence within our lives. If we take seriously the need to study, if we take seriously our relationship with God, we will be covered with a hedge of protection, a hedge that cannot be cut down without our permission. Lord, help me embrace the power of Your presence and Your Word within my life, that I might be able to stand firm upon You and Your desires for my life. Ephesians 6:10 Finally, be strong in the Lord and in his mighty power. For the Christian, victory is the end desire; victory is the end goal. Victory over life, victory over sin, victory over the attempts of Satan. But victory is not possible apart from the Word of God. Victory cannot be obtained if we are not grounded in and walking upon the precepts of the Word. A walk without the Word leads to a fall. A walk without the presence of God is a walk that contains no real purpose. It’s a walk of sightseeing, not one that is life-changing. To make a difference, to obtain victory, we must lean on the mighty power and presence of God in all areas of our lives. Lord, help me live a life focused on You, a life centered on Your Word, and life determined to experience victory in Your name. Ephesians 6:9 And masters, treat your slaves in the same way. Do not threaten them, since you know that he who is both their Master and yours is in heaven, and there is no favoritism with him. What’s wrong with favoritism? This format, this devotion, is not long enough to walk through all the reasons that favoritism is bad, so we shall put some emphasis on the main reason. Favoritism, especially within the Christian spectrum, carries the giver and the receiver into a direction that is not Godly. When we elevate others up, purposefully, to a place of honor, we are honoring them instead of God. When we show them favoritism, we are usually doing so in the seeking of personal benefits and/or recognition. There is nothing wrong with showing appreciation for a job well done or an accomplishment that has been fulfilled, but there is something wrong if it is done for the wrong reason. Everything we do should be done to glorify God and edify His children. Is that your goal. Is that your purpose?